If you are looking for information on the Pigtails & Crewcuts franchise business opportunity, Pigtails Crewcuts franchises or Pigtails and Crewcuts franchising, then you have come to the right place. 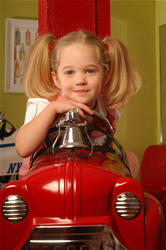 Previous salon experience is not required to operate a Pigtails & Crewcuts franchise. In fact, people with virtually any background can be successful as Pigtails & Crewcuts franchise owners, as long as they are motivated, energetic, share a love for children and make use of the variety of support tools provided by Pigtails & Crewcuts corporate office. Pigtails & Crewcuts poses an excellent franchise opportunity, whether you're a mother returning to the workforce or an experienced entrepreneur looking for a multi-unit investment. 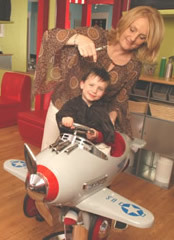 Pigtails & Crewcuts was founded in 2002 by Nanette Adair, an Atlanta stay-at-home mom seeking a child-friendly place for her two young children to get a haircut. Adair who had always dreamed of owning her own business, decided to follow her entrepreneurial spirit and create a place where children could not only get a quality haircut, but also have fun in the process. Shortly after opening the first Pigtails & Crewcuts location in Atlanta, Adair was approached by Wade Brannon, an Atlanta father of three who loved Pigtails & Crewcuts so much that he bought the rights to franchise the concept nationwide. Brannon, former Director of Franchising for Atlanta-based Heavenly Ham expects Pigtails & Crewcuts to open 150 locations by 2009 and more than 400 locations over the next decade.